Confirmed bachelor Lum Edwards is an earnest entrepreneur - stable, yet stumbling. Forever jumping to conclusions, Abner Peabody tends to act first and ask questions later. Together, these silly silver-haired citizens of Pine Ridge, Arkansas are the proprietors of the Jot 'Em Down Store. This good-hearted, if somewhat misguided, pair have such a slow and easy way about them that folks might assume their lives are uneventful - but, nothing could be farther from the truth! Business ventures, mysteries, marriage troubles, and an abandoned baby keep these down home heroes up nights and in hot water. 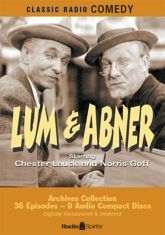 Chester Lauck and Norris Goff star as the amusing and obstinate old timers in 36 consecutive digitally restored and remastered episodes from 1942. And now, let's see what's going on down in Pine Ridge. Please note: This CD-R product is manufactured on demand using recordable media. This allows us to make a wider range of series and episodes available.